For both the novice and for those who have been engaged in prayer for years, here is the one guide needed to practice Jewish prayer and understand the prayer book, from one of the world's most famous and respected rabbis. From the origins and meaning of worship to a step-by-step explanation of the daily prayers to the reason you're not supposed to chat with your friends during services, Rabbi Adin Steinsaltz answers many of the questions likely to arise about Jewish prayer. 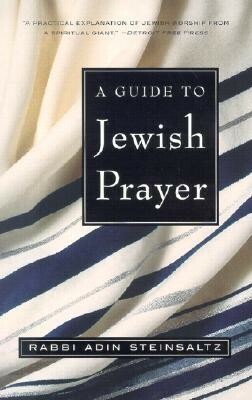 Here are chapters on daily prayer; Sabbath prayer; prayer services for the holidays; the yearly cycle of synagogue Bible readings; the history and makeup of the synagogue; the different prayer rites for Ashkenazim, Sephardim, Yemenites, and other cultural/geographic groupings; the role of the rabbi and the cantor in the synagogue; and the role of music in the service. RABBI ADIN STEINSALTZ is the author of a landmark commentary on the Talmud, as well as many books of Jewish thought. He lives in Israel. "A practical explanation of Jewish worship from a spiritual slant." "Readers familiar with Rabbi Steinsaltz's high level of descriptive prose, which appeals to people with varying levels of Jewish knowledge, will find this volume similarly of great interest." I'm the author/artist and I want to review A Guide to Jewish Prayer.